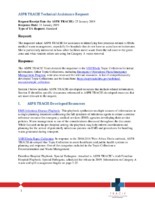 ASPR TRACIE VHF/Ebola Topic Collection, section on Waste Management. ASPR TRACIE EMS Infectious Disease Playbook. The requestor asked ASPR TRACIE for assistance in identifying best practices related to Ebola medical waste management, especially for hospitals that do not have an autoclave or incinerator. She is particularly interested in how other facilities move waste from the red zone to the green zone and what vendors others are using for Category A waste removal. ASPR TRACIE, “ Ebola Waste Management ,” NETEC Repository, accessed April 21, 2019, https://repository.netecweb.org/items/show/450.